4 Bedroom Semi Detached House For Sale in Northallerton for Guide Price £500,000. FEATURED IN THE BIG OPEN HOUSE - Please call for viewing arrangements. 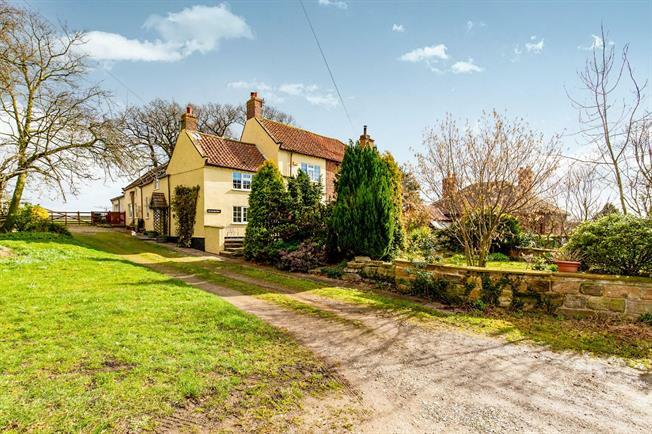 Beautifully presented with traditional character features throughout, 'The Old Post Office' is deceptively generously sized, with two reception rooms and four bedrooms. The property has oil fired central heating in addition to open fires and log burners. Externally there is a front garden which is mostly laid to lawn with well stocked flower beds, to the rear there is a courtyard with views looking across the local countryside, and garage for parking. Traditional style kitchen / breakfast room with a good range of wall and base units, laminated flooring in the kitchen with tiled flooring in the breakfast area. Rangemaster oven with hob, stainless steel extractor fan, Belfast style sink. UPVC double glazed windows. Tiled flooring, uPVC double glazing, plumbing for washing machine and dryer. The dining area is open plan and directly connected to the kitchen, with tiled flooring and uPVC double glazed windows. The spacious kitchen storage room which houses the Oil boiler and has a window looking out across the rear courtyard. The sitting room features a traditional open fire, is fully carpeted with uPVC window overlooking the front garden. The lounge has original exposed beams and an inglenook fireplace with a stunning cast iron Norwegian log burner. Fully carpeted with double French doors opening out on to the front garden. The study is fully carpeted, with uPVC window overlooking the rear courtyard. Downstairs W.C. Comprising a standard flush W.C. And wash basin. Integral garage with electric roller door. The master bedroom is fully carpeted with uPVC window overlooking the front garden. There are multiple fitted wardrobes and a private En Suite shower room. The master En Suite comprises, a double enclosure shower, standard flush W.C. And wash basin and heated towel rail. Fully carpeted with uPVC double glazed window and fitted storage cupboards. The third bedroom is fully carpeted, and has a uPVC double glazed window. The fourth bedroom, has vaulted ceilings, is fully carpeted, with Velux windows providing additional light to the room. The second En Suite comprises a standard flush W.C. Single enclosure shower, and pedestal wash basin. The family bathroom comprises, a claw foot bathtub with mixer tap and shower, a single enclosure shower, pedestal sink and standard flush W.C.